The largest city along the Romantic Road, Augsburg is also among the oldest cities in Germany with a history stretching back 2,000 years. It was established as a Roman trading post and garrison camp in 15 BC and the city has been an important site for religion, politics and the military throughout its life. 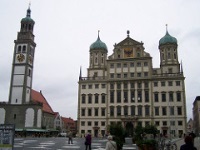 Augsburg has many interesting buildings, including several ornately decorated churches and Baroque houses. Some of the city's most impressive old architecture includes the 9th-century cathedral, the Town Hall built in 1620, the Perlachturm bell tower built in 989, and the Schaezlerpalais which is a mansion dating back to 1765. Other popular tourist attractions in Augsburg include the Augsburger Puppet Theatre and Museum, the Augsburg Zoo, and the botanical garden. Augsburg is also known for its traditional German restaurants, and is a popular stop both on the Romantic Road and on journeys to the Bavarian Alps in the south. This ancient city is picturesque and atmospheric and its popularity with visitors seeking out Germany's ancient history and bygone folk traditions never wanes; it is also a modern city with all the desired amenities and some good shopping opportunities and great hotels.